This "year" my son started school, and this meant days out and holidays are to be taken with the masses in the holidays when the theme parks are busy and holidays are expensive. Bit of a shock to the system, but we knew this would happen. So when my son's school had an inset day on Friday, we decided to take full advantage of it being a school day and take a trip to Chessington. 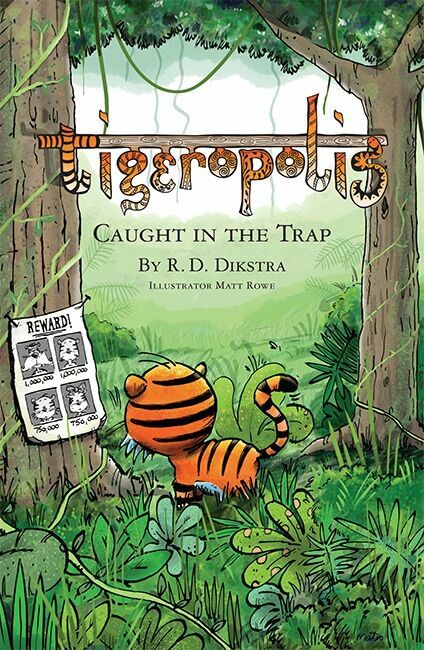 Chessington world of adventures is 60 miles from my home, so what I call 'up the road', it's a day trip but somehow in deciding to 'nip up the road' I thought it would be nice to stay over, and then from that thought came 'wouldn't it be great to make the most of this trip and stay in a Gruffalo themed room'. Something I've never done before and Max is of an age now where he's going to remember his stay as well as the theme park itself. I am so pleased we did this!! We had the most fantastic time! 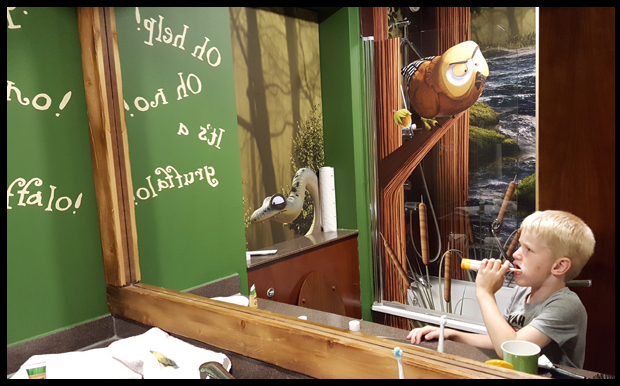 We were treated so well, we got a lot for our Gruffalo themed package and our stay has even prompted us to look into getting annual Merlin passes for even better deals for the summer! I drove up and arrived at the hotel at 9.30am. The park opens at 10 am, but we were allowed to complete all our paperwork and get access to the park straight away! Fantastic!! We are allowed to book in from 2 pm, so my plan was to pop back at 2, freshen up and then go back out for the afternoon - that didn't quite happen. For those who follow my blog will know that we're full time employees and because of this, I took the day of work, but my partner couldn't so he came up after work, as it happened he managed to finish and be up at the resort by 2.30 so he actually booked in and got to see the room, and the reception staff were more than accommodating. We couldn't book our breakfast and evening meal unfortunately due to a system error with the booking system. I do think the hotel would benefit for a second and maybe even a third self-service system, for such issues as it relies on having a table when you want it otherwise. 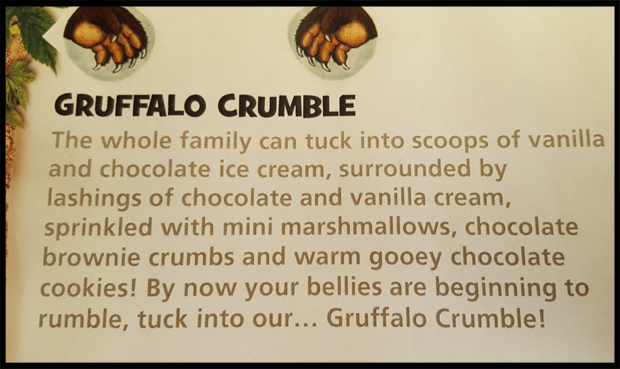 We eat in the Safari Restaurant, and we may have ordered the Gruffalo Crumble for dessert, it took an age to come, but OMG it was massive!!!! Our room was decorated out in the Gruffalo theme of course, and there was even a secret bookcase which had a copy of the book and Gruffalo pops for Max to keep. The room overlooked the safari section of the park, so we could see the animals all grazing and strolling around in the evening. 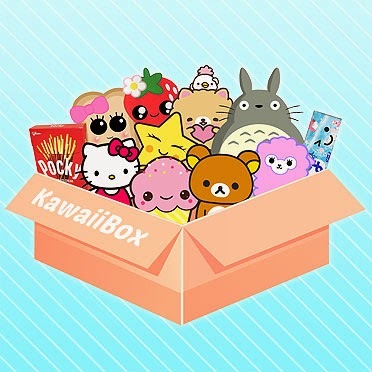 What a magical time to be 5 years old. After that humongous dessert, my son finally bounced off to sleep at around 10.30pm! I did wonder if we'd make our 8 am breakfast slot in the morning! So that was day one! 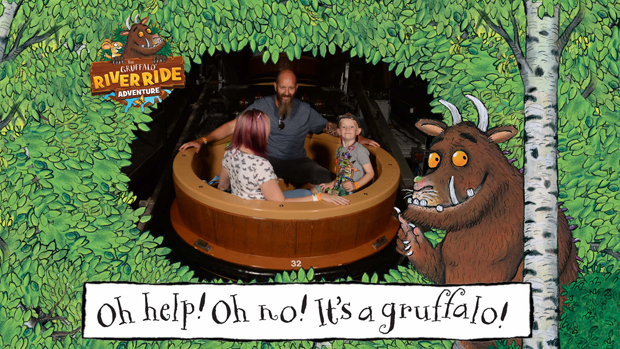 As we'd booked the Gruffalo package, we got a second day at the theme park for free, so not only did we get to the park an hour before it opened, we also got a fast track pass to 14 of the rides! Which came in handy later on in the day as the second day happened to be a Saturday! 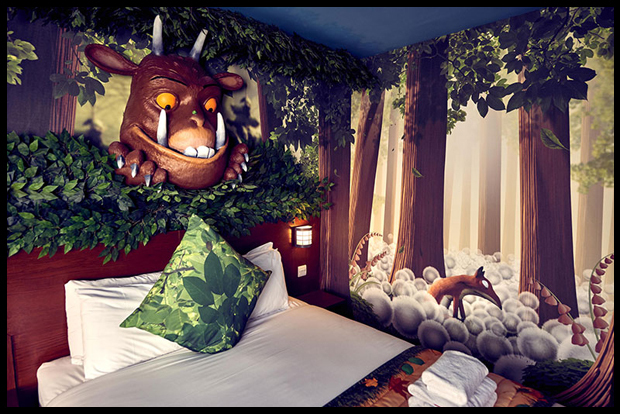 Gruffalo films on the TVs in the room. 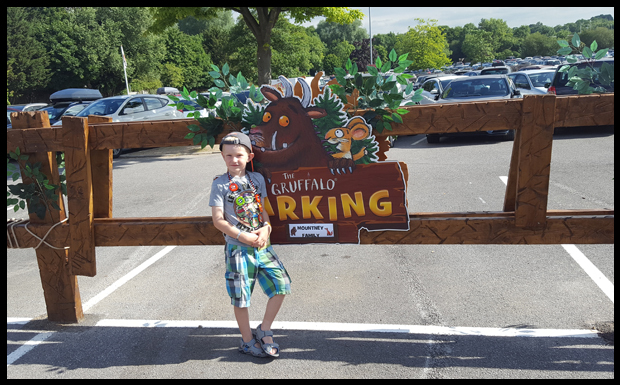 There was so much to see and do, we really felt special and spoilt that weekend and off the back of such a great experience with Merlin and Chessington, we've now purchased Merlin passes so we can take full advantage of the summer holidays! For a theme park that is 'just up the road' for us, I'm so so pleased we stayed, I feel it will be a memory that we all cherish for a long time. For that, Chessington, thank you.